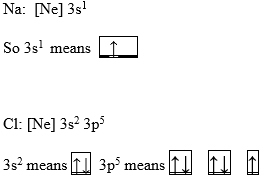 Electron configuration can be expressed in the form of an orbital diagram, where each orbital refers to a subshell and one-headed arrows are used to depict electrons. Each orbital can accommodate only 2 electrons. Pauli Exclusion Principle: no two electrons in an atom can have the same four quantum numbers. Basically this means that electrons must have opposite spins. Paramagnetic: describes electron spins (arrows) that are “parallel” to one another or spinning in the SAME direction. This occurs with UNPAIRED electrons.